I’ve been thinking a lot about her these days, surprising myself, since I knew her simply as a fact stored away in my memory for so many years. Diminutive at just five feet and weighing only one hundred pounds, her small face accentuated by her landmark over sized glasses, there isn’t anything visible to recommend her apart from a flinty chin suggesting determination. Just goes to tell me how short-sighted I am when slipping into judging by appearances. I guess that’s a topic for a follow-up blog. Anyway, small packages sometimes pack a wallop. Ruth Bader Ginsberg hails from Brooklyn, the child of Jewish immigrants from Russia. Think about how wonderful that is, the promise of America, that in a second generation, children of immigrants or an immigrant parent can weave their way into the American success story. Think Steve Jobs (Syria), Walt Disney (Canada), Gloria Estefan (Cuba). Nikki Haley and Nora Jones (India). Think Barak Obama (Kenya). Did you know that a good number of our biggest firms owe their existence to immigrants? Think Boeing (Germany), 3M ( Canada), Home Depot (Russia) for just a few examples. Now most of us know who Ginsberg is, though she doesn’t command the headlines like some of her U. S. Supreme Court colleagues such as Justices Roberts and Scalia. Doubtless this stems from her minority position in a long-dominated conservative court, despite her frequent dissents always highlighted by their precocious acuity. I’m not about to launch a verbose listing of salient background details about Kiki (her nickname), save to note her appointment by President Clinton to the bench in 1993. I’m frankly more interested here in her character traits lending her the individuality for which she’s noted. Although she’s an ardent liberal (former ACLU litigator), she pals with the Scalias, sharing in their mutual love for opera. Her favorites, Verdi and Puccini. On the fun side, she’s been an extra in two operas. I also find her very brave. Twice she’s survived cancer: colon (1999) and pancreatic (2009). With the colon diagnosis she didn’t miss a day on the bench, despite chemo and radiation regimens. Twelve days after her Whipple surgery to remove a portion of her pancreas, she was hearing oral arguments. Pancreatic cancer has very few survivors and apparently they got it early through a routine cat scan. It was the pancreatic cancer taking the life of one of my icons, Steve Jobs, that aroused my curiosity about this angry organ, the pancreas, that led to my researching Ginsberg. Though she’s given up water skiing and horseback riding, she works out with a trainer two times a week and is up to twenty no cheat pushups. She’s fluent in Swedish, acquired from two summers there and says she can watch Ingmar Bergman films without subtitles. Some liberals want her to retire so that President Obama can appoint another liberal as deterrent against a subsequent Republican presidency. 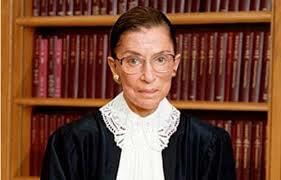 Ginsberg refuses to budge, saying she’ll remain on the bench unless health issues interfere. Though she’s known more for championing equality issues affecting women, it’s clear she’s also an exemplum of the senior citizen’s ability to continue contributing to the workplace and society as a whole. I’m glad she’s there, offering rational balance in a time of deepening national division. This entry was posted in People and tagged Columbia Law School, Felix Frankfurter, pancreas, Ruth Bader Ginsburg, Supreme Court of the United States. Bookmark the permalink.